School Internship Programme is one of the important practical components of the course and it is conducted in the 2nd year. During School Internship Programme teacher trainees are sent to different schools in their respective districts to enable them to gain real classroom teaching experience. The faculty of DIET need to visit the schools for monitoring and evaluation. Last year the programme was conducted for 15 days w.e.f. October 3-20, 2012. Faculty of DIET not only conducts programmes but also undergo varieties of training programs at NERIE, Shillong, NCERT, NUEPA, New Delhi to update themselves with the new development pertaining to teacher education. The following tables show the Trainings attended by the faculty of DIET Gangtok during the year 2012-13. In addition to the above mentioned programmes DIET, Gangtok, is also undertaking Distance Education Programme through IGNOU for D.El.Ed Course for In-service teachers from the year 2013 onwards. There are around 546 untrained primary teachers appointed after September 2001. In order to clear the backlog, 186 nos. of untrained primary teachers have been enrolled in IGNOU in the year 2011 for the said course. 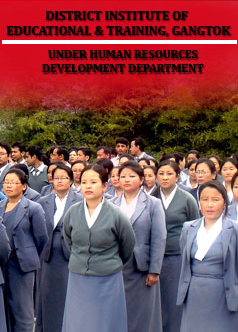 87 primary teachers have enrolled at DIET, Gangtok and the remaining 99 teachers are enrolled in DRC South Namchi.